I'm off to Australia with my family for a week (to consider the ANU job offer), then to a conference in St. Louis, so it might be a couple weeks before I'm blogging again. As a parting thought, it occurred to me to clarify why I'm so interested in mirror images, which I don't think I made explicit in either of my earlier posts on the topic. Such issues might seem merely an amusing irrelevance -- and I do find them (for whatever reason) amusing. But I also have some big game in my (warped, distorted, reflective) sights. If it turns out that the best thing to say about such cases is that (a.) they are veridical, and yet also (b.) our visual experience is different than in the light-straight-to-the-eye case, then I have a hunch that this is a thread I can pull on that might unravel the whole of representational realism -- by which I mean the view that the properties of observed external objects resemble the properties of our experiences of those objects, e.g., that there is something analogously squarish both about an outward square and about our normal visual experience of that square. No guarantees that's where I arrive after fuller consideration, but that's the snark in the bush. When I gaze into a mirror, does it look like there's someone a few feet away gazing back at me? (Someone who looks a lot like me, though perhaps a bit older and grumpier.) Or does it look like I'm standing where I in fact am, in the middle of the bathroom? Or does it somehow look both ways? Suppose my son is sneaking up behind me and I see him in the same mirror. Does it look like he is seven feet in front of me, sneaking up behind the dope in the mirror and I only infer that he is actually behind me? Or does he simply look, instead, one foot behind me? Suppose I'm in a new restaurant and it takes me a moment to notice that one wall is a mirror. Surely, before I notice, the table that I'm looking at in the mirror appears to me to be in a location other than its real location. Right? Now, after I notice that it's a mirror, does the table look to be in a different place than it looked to be a moment ago? I'm inclined to say that in the dominant sense of "apparent location", the apparent location of the table is just the same, but now I'm wise to it and I know its apparent location isn't its real location. On the other hand, though, when I look in the rear-view mirror in my car I want to say that it looks like that Mazda is coming up fast behind me, not that it looks like there is a Mazda up in space somewhere in front of me. What is the difference between these cases that makes me want to treat them differently? Does it have to do with familiarity and skill? I guess that's what I'm tempted to say. But then it seems to follow that, with enough skill, things will look veridical through all kinds of reflections, refractions, and distortions. Does the oar angling into water really look straight to the skilled punter? With enough skill, could even the image in a carnival mirror look perfectly veridical? Part of me wants to resist at least that last thought, but I'm not sure how to do so and still say all the other things I want to say. One resolution might be to strip away the specifically sensory, spatial sense of "looks" or "appears", assimilating to cases like "It looks like you're headed for a C" as I gaze over someone's final exam (cases which, in turn, might be assimilated to entirely non-visual cases like "It looks like we might be in Libya a long time" said after hearing a radio broadcast). That maneuver doesn't satisfy me, though: I want, if I can have it, some robustly visuospatial sense in which the Mazda looks like it's behind me and yet the restaurant table looks like it's in front of me. My father was a graduate student in psychology and education at Harvard in the 1960s. Along with B.F. Skinner and one other graduate student, he founded "The Harvard Humanists". 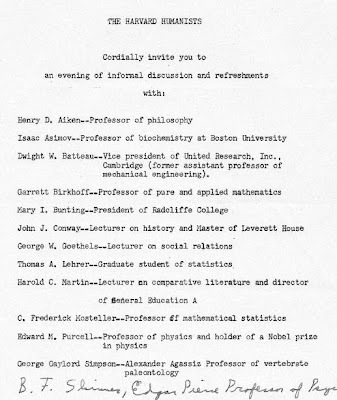 Going through old papers, he recently found the following mimeographed announcement of an "evening of informal discussion and refreshments" as I have reproduced below. 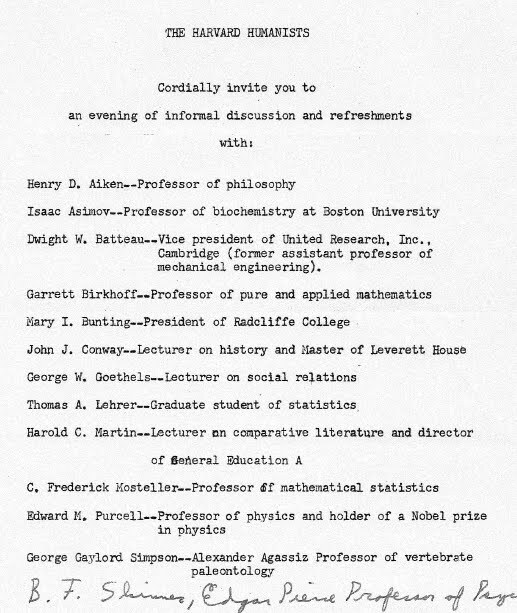 For this particular meeting, attendees included Isaac Asimov, Mary Bunting (president of Radcliffe), Tom Lehrer (yes, that Tom Lehrer), Frederick Mosteller (one of the most eminent statisticians of the 20th century), Nobel physicist Edward Purcell, George Gaylord Simpson (one of the most eminent paleontologists of the 20th century), and of course B. F. Skinner (whom they apparently took for granted and forgot to include in the typed proof). Ah, Harvard in the 1960s! What a group of have informal discussion and drinks with. Just thought I'd share. Non-philosophers' judgments about hypothetical philosophical scenarios are often labile and variable. They are subject, for example, to substantial order effects, and they vary by culture and gender. Question: Are professional philosophers' judgments about such hypothetical scenarios particularly better grounded? Jonathan Weinberg and Stephen Stich say no. Timothy Williamson says maybe yes. At stake, perhaps, is the reliability of "armchair philosophy" as a research method. Fiery Cushman and I have started to examine the question experimentally. We begin by examining order effects on moral judgment: We presented hypothetical moral scenarios, in varying order, to three sets of respondents: professional philosophers, academic non-philosophers, and non-academics. (The professional philosophers had graduate degrees in philosophy and were mostly drawn from Leiter-ranked PhD-granting departments.) Non-philosophers, we suspected, would respond differently to the scenarios depending upon the order of presentation, a sign of instability and unreliability in judgment. Our question was: Would professional philosophers show smaller order effects and thus more stable judgments? They did not. In fact, the overall trend across our data (marginally statistically significant) was for philosophers to show less stability their responses. This was true even for the subgroup of 91 respondents reporting a PhD in philosophy and a competence or specialization in ethics. So, for example, the classic trolley problem comes in two versions. In the switch version, a bystander diverts a runaway trolley onto a sidetrack, killing one person on that sidetrack to save five people on the main track. In the push version, a bystander pushes a heavy person into the path of a runaway trolley, preventing the trolley from killing five people further down the track, but killing the heavy person. Now, whether they think such actions are good or bad, the majority of respondents rank the two actions the same when they are presented side-by-side. But order of presentation influences this result: Respondents are substantially more likely to rank the two actions the same when the push version is presented first than when the switch version is presented first. (Why? Intuitions about switch are unstable, and tend to descend to match push, if push is presented first. Intuitions about push are more stable, shifting around less, and thus often will not rise to match switch when switch is presented first.) Non-academics rated switch and push equivalently 53% of the time when switch was presented first and 68% of the time when push was presented first. For academic non-philosophers, the differential was 55% vs. 71%. For professional philosophers, it was 54% vs. 73%, including 50% vs. 75% for the ethics PhD subgroup -- effect sizes well within statistical chance of each other. Moral luck scenarios (e.g., drunk driver hitting a tree vs. hitting a girl) and action-omission scenarios (e.g., snatching away a drowning person's life vest vs. failing to offer him a life vest) produced similar results. In each case, the order effects were about the same size for philosophers and non-philosophers. In our aggregate measure, philosophers (including ethics PhDs) trended toward showing slightly larger order effects overall than did the two comparison groups. For further details, see our manuscript here, forthcoming in Mind & Language. ... has voted me a job offer. It's not fully official yet, but it's official enough that I will be flying my whole family to Australia to check out Canberra early next month. Added March 17: I encourage prospective UCR graduate students whose decision would be influenced by my presence or absence from UCR to email me before making their own decision. My family and I will be visiting ANU from March 31 to April 8, and we're hoping to make the decision shortly thereafter -- though I can't guarantee that we will have decided by the April 15 deadline for graduate enrollment decisions. New essay in draft here, co-authored with Joshua Rust. We examine the self-reported moral attitudes and moral behavior of 198 ethics professors, 208 non-ethicist philosophers, and 167 professors in departments other than philosophy on eight moral issues: academic society membership, voting, staying in touch with one's mother, vegetarianism, organ and blood donation, responsiveness to student emails, charitable giving, and honesty in responding to survey questionnaires. On some issues we also had direct behavioral measures that we could compare with self-report. Ethicists expressed somewhat more stringent normative attitudes on some issues, such as vegetarianism and charitable donation. However, on no issue did ethicists show significantly better behavior than the two comparison groups. Our findings on attitude-behavior consistency were mixed: Ethicists showed the strongest relationship between behavior and expressed moral attitude regarding voting but the weakest regarding charitable donation. Warning: This essay is monstrously long -- 70 pages! In earlier (uncirculated) drafts we had tried to keep it to normal journal-article length, but eventually we decided to give up on that. It's a very complicated study, so it just takes some space to lay it all out properly. The only way to actually perceive depth -- to see it rather than judge it -- is with binocular stereoscopy (p. 114). Stereo vision, however, now that I am mostly monocular, is quite compromised -- completely missing in the upper half or two-thirds of my visual field, though partly intact at the bottom, where I retain some peripheral vision. So I see the lower halves of people in stereoscopic depth, while their upper halves are completely flat and two-dimensional (p. 173). With one eye occluded, I have no sensation of distance or depth whatever (p. 157). Such [multifactorial] views [of depth perception], while wholly consistent with a behavioral or empirical theory of vision, give no weight to the qualitative and subjective aspects of stereoscopy. Here one needs inside narratives, personal accounts of what it is like to suddenly gain stereo vision after a lifetime of stereo blindness... or to suddenly lose it after a lifetime of seeing in stereo [as in Sacks's own case] (p. 140-1, fn 14). I wonder, though: Why is permanent loss or gain of stereoscopy necessary to the subjective evaluation? Can't the binocular among us at least temporarily mimic monocular experience simply by closing one eye? Does doing so make the world go from three-dimensional to flat? It doesn't seem that way to me. Nor to most other people I've interviewed. Maybe depth is a little richer and more striking binocularly than monocularly -- but the difference is nothing so radical as the difference between 2-D and 3-D. Some of my interviewees, though, do characterize the monocular-binocular difference as 2-D vs. 3-D; and so do, for example, Ernst Mach (1886/1959) and Brian O'Shaughnessy (2003). Call those who report radically different monocular vs. binocular experience, like Sacks and O'Shaughnessy, the PuffOuters. Call those who report pretty similar monocular vs. binocular experience, like me (see also Chapter 2 of my recent book), the StaySamers. Question: Is the difference between PuffOuters and StaySamers a real difference in experience? That is, does the world actually seem to puff out and go flat for PuffOuters, depending on whether it is seen monocularly or binocularly, while it varies little for the StaySamers? Or is the group difference mainly a difference in report only, with everyone having pretty much the same monocular vs. binocular experience -- and some people mistaken about or misdescribing their experience (in line with some of my conjectures in Chapter 2)? We might start to address this question empirically as follows. Sacks mentions that people differ substantially in how they experience three-dimensionality when presented with stereoscopic pictures -- that is, when presented with slightly offset pictures, one to each eye, producing a three-dimensional effect (like in contemporary 3D movies). For example, when presented with a stereoscopic picture of an impossible M.C. Escher tuning fork, Sacks reports one person saying it looked like the top prong rose about 3-4 centimeters from the plane of the page, while two others reported seeing the prong as 12 cm above the plane and Sacks himself saw it as 5 cm higher still (p. 134-5). Conjecture: If the PuffOuter-StaySamer difference is a real difference in experience, the PuffOuters should, as a group, report much larger effects of that sort than the StaySamers. That could be tested empirically. Presumably PuffOuters should also better detect subtle stereoscopic effects -- which is even more appealing experimentally because it would permit catch trials to corroborate any differences in subjective report. Yes, this is totally do-able. 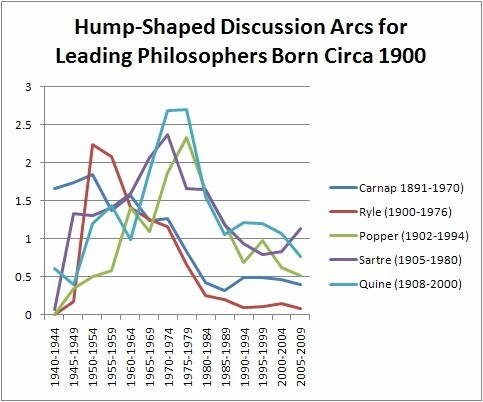 Now, earlier in 2010, I had run a series of posts on what I call "discussion arcs", using as my measure the rate at which terms appear in keyword searches in the Philosophers Index database, over time. Naturally, it occurred to me to wonder whether the Ngram would deliver similar results. Some obvious differences are Ngram's broader expanse of time and the difference between the whole universe of books as a database vs. just philosophy sources -- especially the potential swamping of philosophy sources with non-philosophy sources. But even if we confine the search terms to names of philosophers that are distinctive enough so that we can assume that the references are mostly to those specific philosophers, there are important differences between the results. 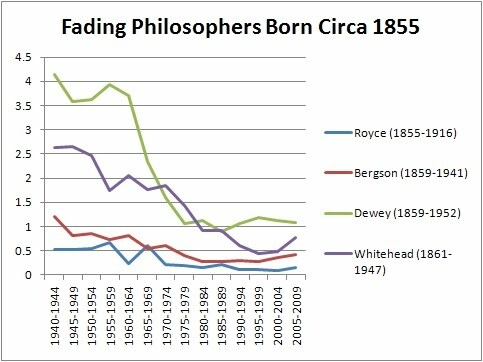 My interpretation: Not only is there an understandable delay between when a philosopher earns discussion by peers and when that discussion spreads into the universe of books as a whole, but there is an even more substantial delay between when philosophical discussion fades and when that fading begins to register in the universe of books as a whole. Philosophy of science is much less about Popper now than it was in the 1970s, despite the Ngram graph. And Josiah Royce? Most contemporary philosophers know him only as someone who used to be a famous American philosopher; few could, I suspect, name even one of his works or positions. I wish I could link you through to open-access penultimate drafts, but JCS didn't seem to be keen on that idea. Feel free to email me, though, and I can send you PDFs of the work on which I am co-author (for personal use). I will be delivering the keynote address at a graduate conference in St. Louis next month. The title of my talk is "The Problem of Known Illusion and the Problem of Unreportable Illusion". Here's the call for papers. I will be hanging out for the duration of the conference and would of course be happy to chat with any conference participants. Call for Papers/Abstracts: PHILOSOPHY OF MIND, CONSCIOUSNESS, etc. The Philosophers’ Forum at the University of Missouri, St. Louis invites submissions of high quality graduate student abstracts or papers to our 6th annual Gateway conference. This year’s topic will be on the topic of Introspection, broadly construed. Possible areas relevant to this topic include philosophy of mind, cognitive science, philosophy of science, epistemology, ethics, and philosophy of religion.